I’m particularly enamored with glades, and after nearly 30 years of exploring Missouri’s Ozark Highlands, there aren’t many glades of any significance that I haven’t visited at some time or another. However, during my mostly unproductive Memorial Day weekend collecting trip, I had a chance to visit Bona Glade Natural Area in Dade County for the first time. Located in southwestern Missouri where the Ozark woodlands of the Springfield Plateau begin transitioning to the grasslands of the Great Plains, this small (20 acres) sandstone glade is noted as a station for the federally threatened and state endangered Geocarpon minimum. 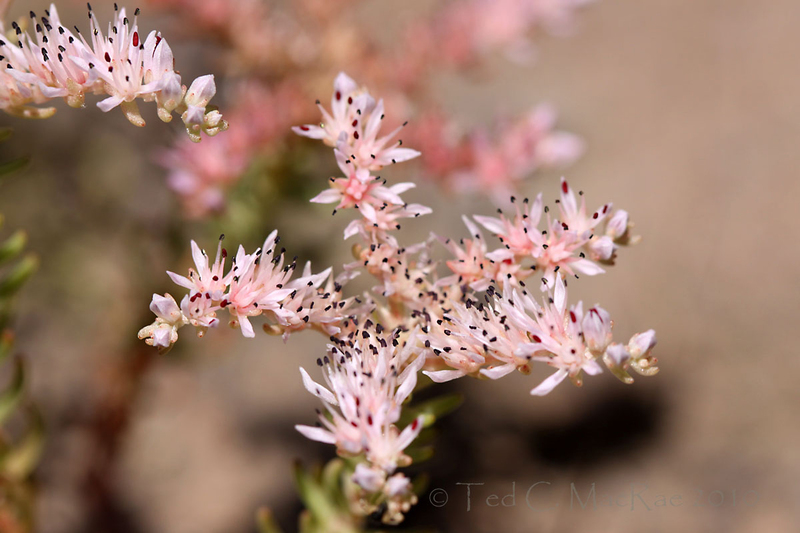 I did not see this diminutive plant (sometimes called tinytim) during my visit, but I did see another pretty little succulent – Sedum pulchellum. Also called widowscross, this plant belongs to the Crassulaceae – the same family as the familiar jade houseplant. Although not nearly as rare as Geocarpon, widowscross is nevertheless somewhat restricted in Missouri, occurring primarily in the southwestern quarter of the state. Throughout much of its range it is primarily associated with calcareous limestone glades, ledges, and outcrops (Baskin and Baskin 1977), but in Missouri it grows also on acidic chert and sandstone glades (Yatskievych 2006) – as is the case at Bone Glade. I’ve not encountered this plant before, thus when I spotted this little stand with its profusion of brilliant pink blossoms, it immediately caught my attention. A winter annual, this species prefers full sun and well drained, disturbed soils and apparently produces seeds quite prolifically when grown under the right conditions. These features, along with its petite attractiveness, would seem to make it an ideal native alternative for succulent gardens. 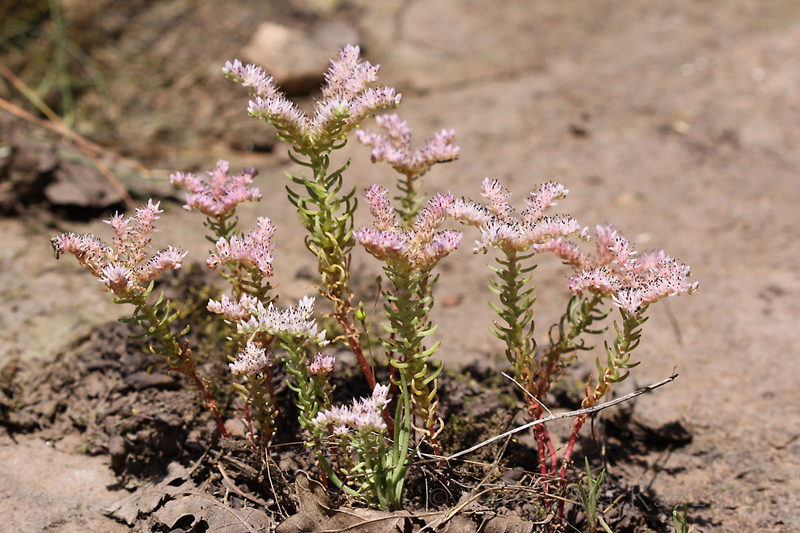 Another, much less common sedum also occurs at Bona Glade, Sedum nuttallianum (Nuttall’s sedum). This species is similar to S. pulchellum but can be distinguished by its smaller leaves and yellow blossoms. It’s range is similar to that of Geocarpon, growing almost exclusively on chert and sandstone glades from southwestern Missouri and southeastern Kansas south to Louisiana and Texas. 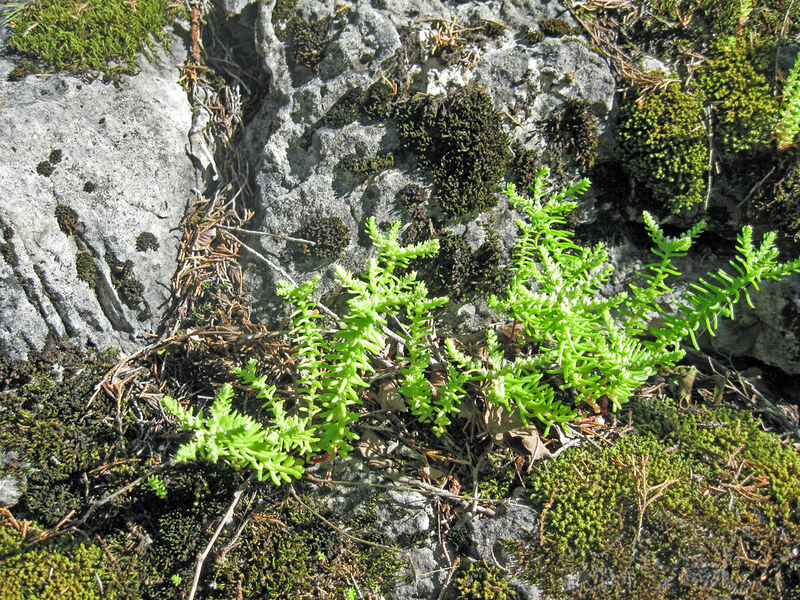 I did not see this plant either – in fact, after finding this small stand of S. pulchellum I searched the entire glade rather thoroughly and did not see any other plants of that species either. Photo Details: Canon 50D (ISO 100-200, 1/400-500 sec, f/5.6), Canon 100mm macro lens, ambient light. Post-processing: minor cropping, levels, unsharp mask. Baskin, J. M. and C. M. Baskin. 1977. 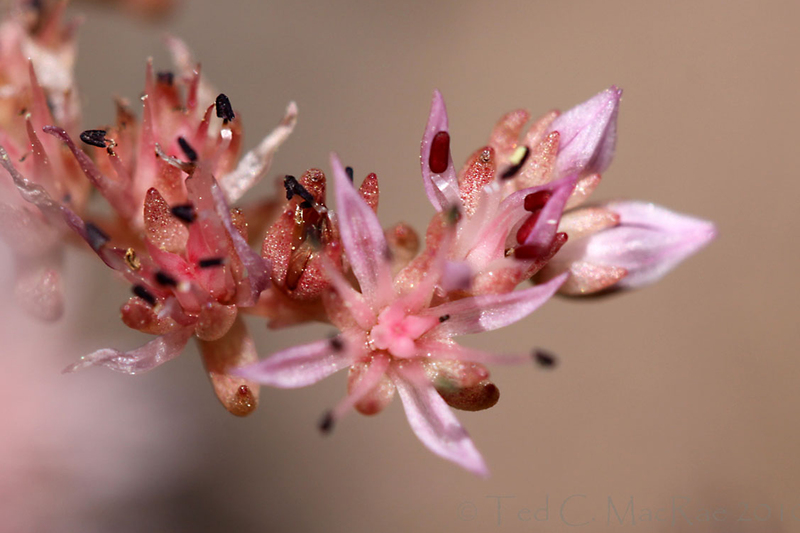 Germination ecology of Sedum pulchellum Michx. (Crassulaceae). American Journal of Botany 64(10):1242-1247. This entry was posted in Crassulaceae, Plantae and tagged Botany, glades, Missouri, native gardening, nature, science, wildflowers. Bookmark the permalink. P.S. I assume that you’ve been to the “Hercules Glades”? Why thank you, altonwoods. Yes, that plant in your photo sure looks like this species. I adore Hercules Glades and have been there many times over the years. It is among my favorite spots in all of Missouri! You’re welcome, Margarethe – and oh, how I would love to see an ‘alpinum’ in Germany! In my garden, this pretty little plant behaved as an annual, and does not tolerate competition, i. e. any shading by taller plants, which is almost any other species. The broader-leaved and shade-tolerant perennial species S. ternatum is also native and is more versatile as a yard plant, while S. pulchellum is best as a rock-garden or succulent-garden plant. Nice pictures as usual, Ted. I like stonecrops a lot, but agree with James that this little beauty is not easy to grow in our area. I’ve had great luck with S. ternatum however. It’s a dependable performer and spreads nicely. S. nuttallianum is not as showy as this one. I’ve seen it at Wildcat Glade near Joplin. I also ran into a nice population of S. sarmentosum in Lon Sanders Canyon in Wayne County. It’s not a native of course, but attractive nevertheless. Thanks, John. Sedum ternatum sounds like a good choice for a cool, moist spot in the garden. Those vivid pink flowers of S. pulchellum, however, just had me mesmerized! I hope I can encounter S. nuttallianum someday – even if it’s not as attractive as S. pulchellum, there is always pleasure in finding rare and uncommon natives.